Greetings from Dan and Debra. We would like to introduce you to our Ledges condo and the many features that await you for fun and relaxation. We outfitted this Ledges condo to be versatile. Up to 8 people can comfortably enjoy the many amenities this condo offers. VIDEO TOUR: A video tour of our condo is available. Just click through our photos to find the video. Please read the description and view the photos. 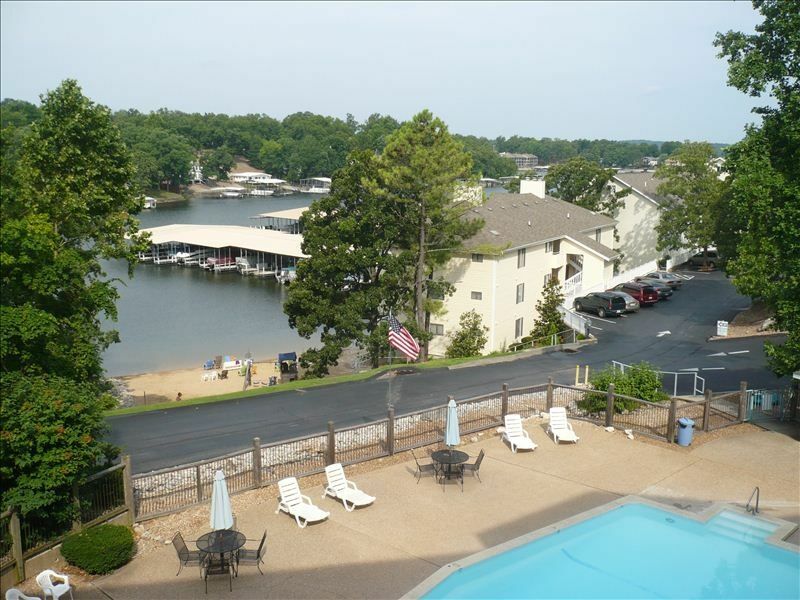 We are here to assist you in any way we can to ensure that you have a relaxing, fun time at the lake. If you have any questions after reading the details below, please contact us and we will be pleased to provide an answer. * Nice view of one of the 2 the pools, the beach, and the cove from the spacious balcony. * Easy access to one of the Ledges pools and is also close to the Ledges beach. * Master bedroom is furnished with a king bed with plenty of room to spare for the dresser and loveseat. * Bedroom number 2 has a queen bed. * Bedroom number 3 has twin beds. * Queen hide-a-bed couch completes the sleeping arrangements. * TV's in the living room and all bedrooms. * Fully stocked kitchen - everything our guests might need for preparation of small or large meals. * Propane gas grill on the balcony. The Ledges is close to all that Osage Beach has to offer. Shopping is nearby. There are lots of restaurants to satisfy every taste. There is nightlife to for most anyone. Are you a boater? We have a 14 x 40 or a 12 x 30 boat slip available for rental ($10 per night). Rental fee may be waived depending on length of stay. Our docks are close by for easy access. Trailer parking is available at the Surdyke Port 20 marina located very near the Ledges. Don't have a boat?? Fishing is allowed from the docks. PLEASE SPECIFY IF YOU NEED A SLIP WHEN INQUIRING. Greetings. My name is Dan Sutton. My wife, Debra, and I completed the purchase and preparation of this wonderful 3 bedroom condo in June of 2011. We have been St. Louis area residents for over 30 years. I retired from a career in IT and Debra is a paralegal. I primarily handle the rental related activities for the condos, but Debra's invaluable assistance and insights really help to make everything run smoothly. I am a people person and I really enjoy the interaction with our guests. We feel that it is a privilege and a blessing to be able share our condo with others who wish to enjoy all the lake area has to offer. Many of our guests are first-time renters, but we have many folks who return often. We really enjoy being at the lake whether it is for relaxation or to perform tasks to enhance our guests' visits. We are always looking for ways to improve the lake visit experience for our guests. We really mean it when we say that we want to do all we can to assist our guests to ensure that their visit to the lake is relaxing and enjoyable. This 3 bedroom condo is great for families because of the close proximity to a pool and the beach. But, adult groups can certainly enjoy all this condo offers. The fact that there are no steps to enter the condo, provides easy access for folks who cannot handle steps. The balcony is very large and provides a nice view whether by day, at sunset, or night. Debra has commented that she enjoys seeing the lighted pool at night. The Ledges has a small beach for swimming. There is a good view of the beach and cove from the large balcony. Nice view of the cove, pool, beach, and sunset from the balcony. Linens are provided for each bed plus the hide-a-bed couch. Parking directly in front of the building. No steps for access to the condo. Bath towels, hand towels, and wash cloths are provided for inside use only. Guests should bring their own towels for outdoor use. Starters for paper products are provided. Guests should bring or plan to buy any condiments or spices. Dining table plus seats at the kitchen counter. Table and chairs for outdoor dining on the balcony. TV's are provided in the living room and each bedroom. A DVD player is available in the living room. Free access to Netflix movies on the living room TV. Small stereo in the living room. Available on the TV in the living room. No disk library, but lots of movies available via Netflix on the living room TV. Large deck overlooking one of the pools and the Ledges beach. Nice table with seating for 8. Roll-down sun shades. The Ledges has 2 pools and a small beach for the lake. Our balcony is above one of the pools which allows parents to keep an eye on the kids at the pool. The point pool has lake on 3 sides. DIRECT ENTRY TO THE CONDO FROM PARKING - NO STEPS!!!! ; large balcony with view of the pool, beach, cove, and lovely sunsets. Free streaming Netflix movies, huge master bedroom. Kinda tired looking & could definitely use a good, heavy duty cleaning, especially the balcony - ceiling & all. Ok, but could use some updating. I am sorry that you found deficiencies in our condo. I am unsure of what your expectations are, but they certainly appear to be different from the many recent guests who have stayed in this condo and provided 4 and 5 star reviews. Nonetheless, as I previously explained to you, updates to this condo are underway. We will certainly take note of your comments and try to address your points. Condo was perfect size for a guys trip. The location was perfect to be within 20 minutes of all the golf courses. Grill to use for dinners in after long day of golf. Beach to swim at or pool right outside the door basically. I would definitely stay at again and recommend to anyone looking for place stay. Thank you for choosing to stay in our Ledges condo. Thank you also for taking time to post your review. We are pleased that the stay was enjoyable and the location worked out well for the golfing. We do try to provide a clean, comfortable, and relaxing condo. We are glad that you found that to be true for you. We hope that you will choose one of our condos for the next visit to the lake area. It was good for the price. The location was nice, the price was cheap for a holiday weekend. Dan was easy to communicate with. There needs to be some bug control on the patio. We couldn’t sit out there because of the large amount of spiders. Great experience from start to finish. Beautiful condo. Would definitely stay again. We had a great time, the owners are very sweet people, this place was very nice. Great location and very clean! Right by the water! It was awesome having the boat slip. Would definitely stay again!! Hiking trails are available in the nearby state park (entrances from Hwy 54 or Hwy 42) or in Ha-ha Tonka state park located about 12 miles from the condo.